A rich history and dramatic landscape are just the first of many reasons to visit Modica. An art, history and foodie lovers paradise in the mist of Sicilian hills, this unique town divides itself into to parts – Upper and Lower Modica. 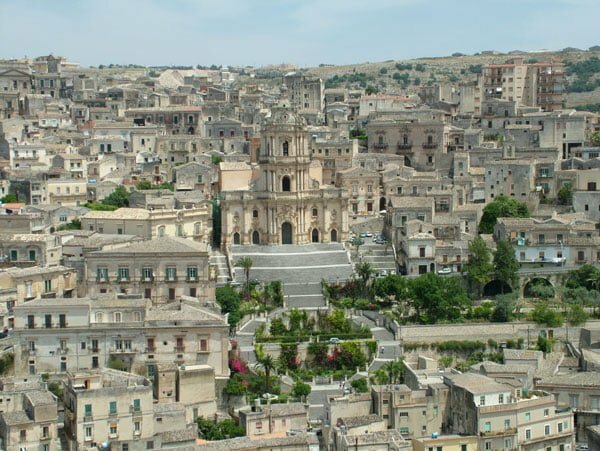 Well known as the city of 100 bells and 100 churches, Modica has plenty historic art and architecture to offer. Learn more about the area and what it has to offer in our city guide below. Originally named ‘Motyca’, this Sicilian stronghold is yet another to have been inhabited by a mixture of Greeks, Romans, Byzantines, and various other conquering empires including the French and Spanish. Like much of Sicily, the 1693 earthquake devastated the area. Although from this, the city reinvented itself through the use of new Baroque designs. An opportune time to visit would be Easter, during the “Madonna Vasa Vasa” celebrations. The festivities involve a colourful procession, displaying a large statue of the Madonna to bless the resurrection of Christ. Looking for a more slow paced Modica? Local farmhouses and settlements are to be found not far from the centre and allow visitors. Many settlements are carved into the rock and are steeped in history and are great attractions for kids as the imagination runs wild. Foodies can satisfy a sweet tooth during their trip to Modica with a local speciality. Modica Chocolate is prepared using a traditional recipe unique to the area, showcasing the influence the Spanish left after the medieval inhabitance. The production is not restricted to the simple chocolate bar, why not try the Chilly Pepper infused Chocolate Liquor? A local favourite! The city relies on family business. Many small independent shops and cafes can be found in the quaint streets and often feature home style kitchens. This is authentic Italian cooking at its finest and most rustic!